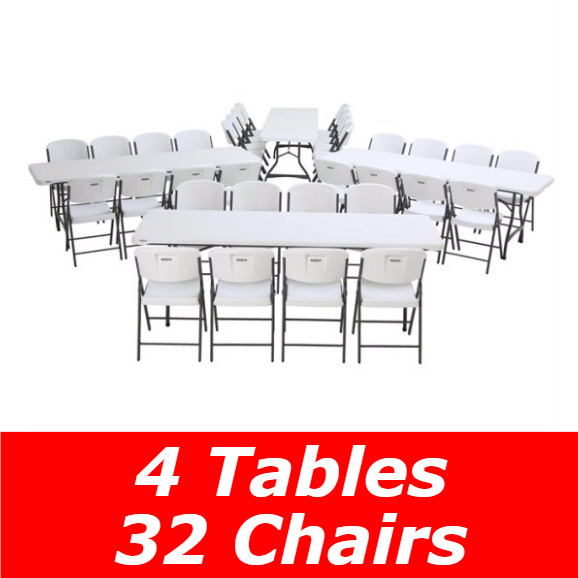 Lifetime Commercial Folding Tables and Chairs - 80174 32 Folding Chairs 4 Folding Tables - Package Deal. Sometimes ordering in bulk packages just works better on the pocket book. 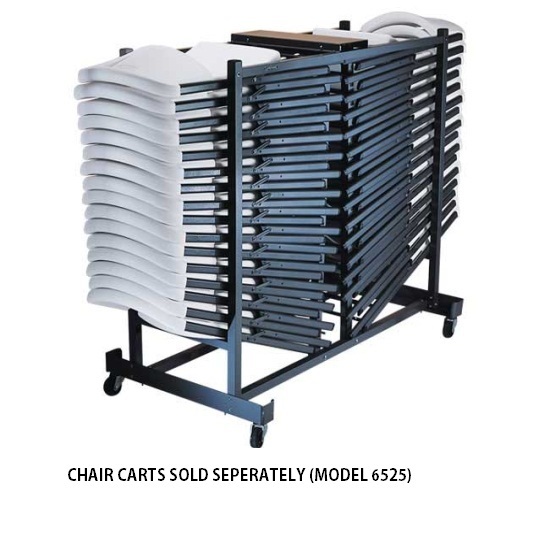 By ordering the 80147 of Lifetime folding chairs and folding tables you save over $75 than ordering the tables and chairs separately. 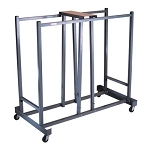 The folding tables in this package are the 42980 Commercial Lifetime Tables. 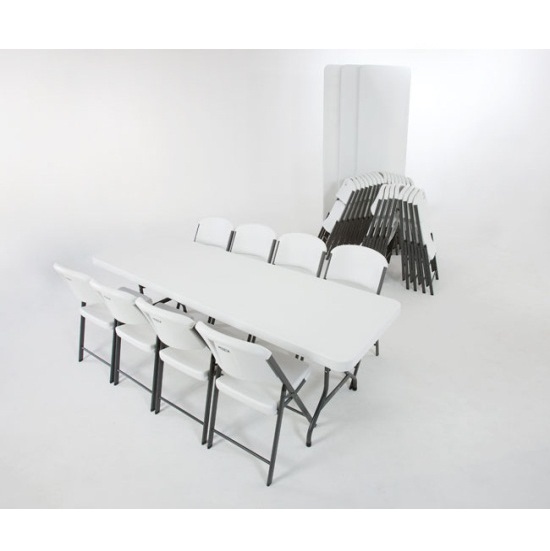 These folding tables feature a white granite, 8-foot table top. 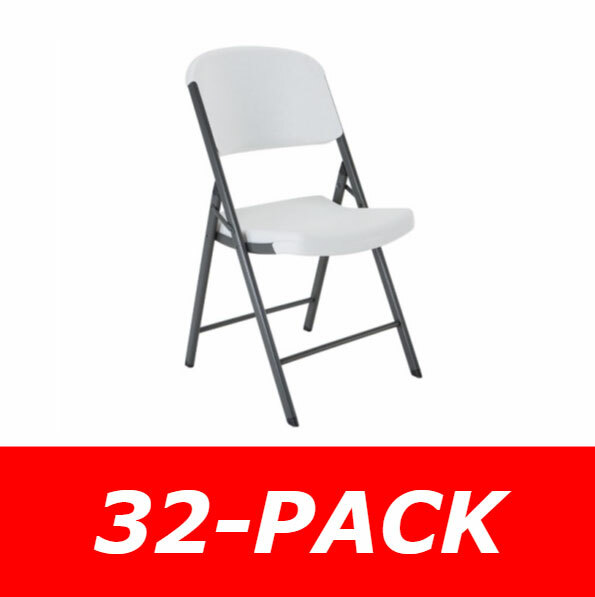 The folding chair in this package is the 2802 Lifetime folding chairs, which are matching white granite products. Order multiple quantities of these products and save more. Model 42980 is used in this package. 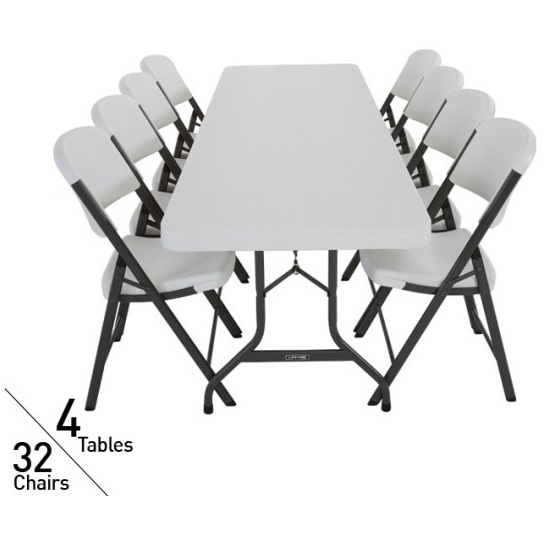 Table top size: 96 inches L x 30 inches W.
Folding frame color: hammertone gray. Folded table thickness: 2 inches. Per table weight: 41 lbs. Table top material of construction: polyethylene plastic. Each Lifetime table comes with a 10 year warranty from Lifetime Products. Folding chair seat and back material of construction: polyethylene plastic. Folding chair frame material of construction: powder-coated steel. Chair overall height: 34 inches. Individual chair weight: 11 lbs. Each Lifetime chair comes with a 10 year warranty from Lifetime Products. Shipping weight: about 723 lbs. 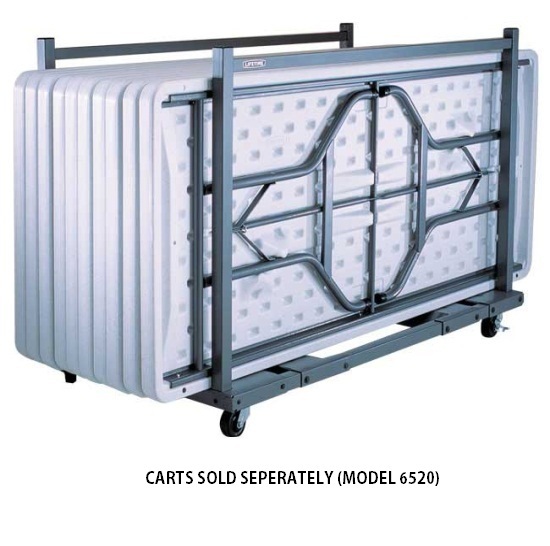 Product ships via an LTL freight carrier for a curbside delivery. The freight company unloads the items from the truck, but do not deliver inside unless you have a loading dock. Received the table and chair package in a very short time after ordering. Items were purchased for the United Methodist Church. Everyone associated with this purchase are well satisfied and looking forward to a future order. These are a very nice quality. We like the convenience of the tables folding up for easy transporting. The tables exceeded our expectations, much more sturdy and stable than other folding tables that we have had in the past. This is perfect for family reunions because we have such a large family. They hold everyone, are very sturdy and even comfortable. Worth your money. I purchased a set of 4, 8 foot tables and 32 chairs for use in my outdoor Pavilion. We use them for everything from live music events to wedding rehearsals. 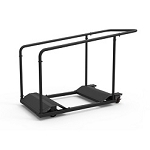 The best thing is that they are very durable and I would highly recommend these items. I am a Pastor and we ordered this set of 4 tables and 32 chairs about a year ago and couldn't be happier. Easy to clean and durable. Our people absolutely love them. Q: I am needing to possibly order 4 sets of this product. Do you have a cheaper rate if I buy that many sets? also do you have a roll cart that will hold the chairs? Pending your response. Q: What do I do if something is damaged in shipping? A: Just give us a call and we will get you taken care of. No worries. These are rarely damaged, that when they are we have you covered. We file the freight claim and all that, you don't have to worry about any of that. Was this answer helpful? 9 of 13 Customer(s) found this Answer helpful. Q: What exactly does white granite mean? A: It is a brilliant white collar with tiny black little flecks or speckles. 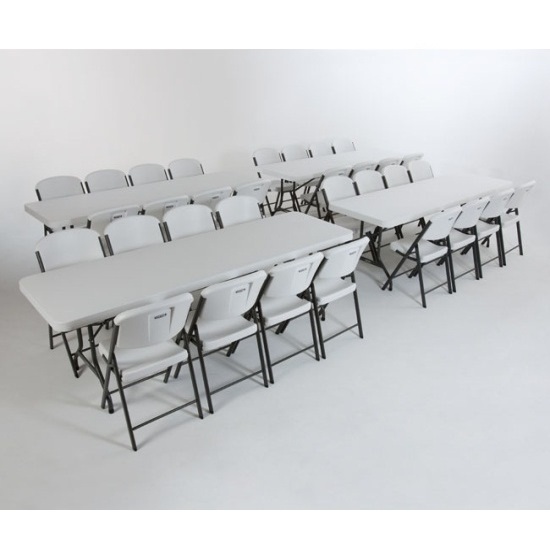 Shipping: Orders for the 80147 Lifetime Tables and Chairs Combo Pack generally leave the warehouse the next business day. Dimensions: 97" x 44" x 30"